DVD Synopsis: A thousand years after a global war, a seaside kingdom known as the Valley of the Wind remains one of only a few areas still populated. Led by the courageous Princess Nausicaä, the people of the Valley are engaged in a constant struggle with powerful insects called Ohmu, who guard a poisonous jungle that is spreading across the Earth. Nausicaä and her brave companions, together with the people of the Valley, strive to restore the bond between humanity and the Earth. Like many of director Hayao Miayazaki’s films, Nausicaa of the Valley of the Wind is at its most exquisite when the action takes to the skies. The scene where Nausicaa is flying through the air on her glider, saving a traveler who has wandered too close to the toxic jungle, is breathtakingly beautiful. The magic of flight has always been a trademark of Miyazaki’s best work, and he uses it to wonderful effect in most of his films. Whenever a Miyazaki character is soaring through the air, the excitement swells, the tension builds, and something quite extraordinary usually follows. Nausicaa of the Valley of the Wind is no exception. 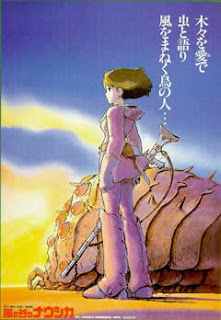 I absolutely love Nausicaa. I usually have an inner struggle when it comes to ranking Miyazaki's films, but somehow Nausicaa always manages to make it to the top. It's my favorite for some magical reason and I'm ok with that.